It has been 2 weeks since HFB started school, and life has been really hectic. One day assignment, the next day, written test. 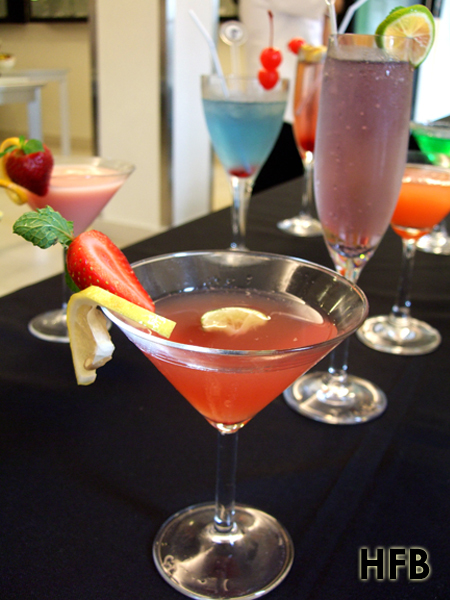 However, he learned to create his own mocktail this week - and the name of this concoction - "A Crazy Little Thing Call Love". 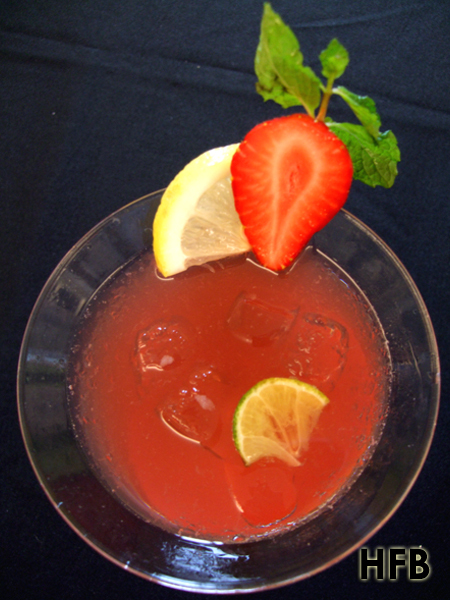 Orange Juice, Lychee Syrup, Strawberry Syrup topped with Tonic Water and a hint of Red Grenadine Syrup. Add a dash of Lime Juice served in a Chilled Martini Glass garnished with Strawberry and Lemon Slice - sweet & sour, with a tint of bitterness all rolled in one. 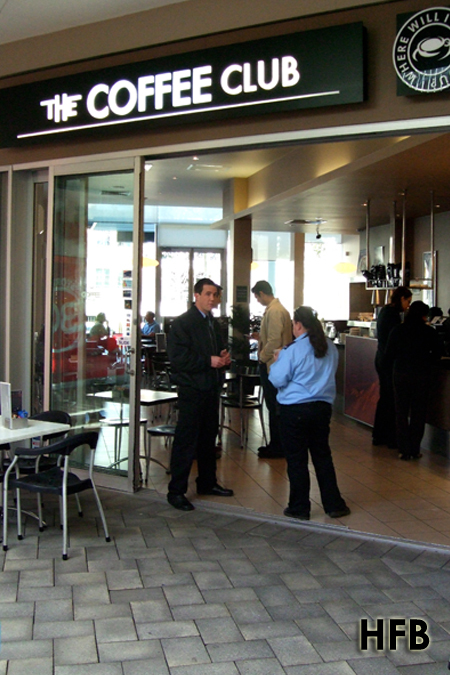 It’s funny how HFB studied in Perth for 2 years, and he only been to this Italian restaurant once, for dessert, but never for their dinner. Although it might not look much of a place as compared to many others, the food here speaks volume. If you do not believe, just take a look at the queue outside the restaurant each day starting 6pm onwards. 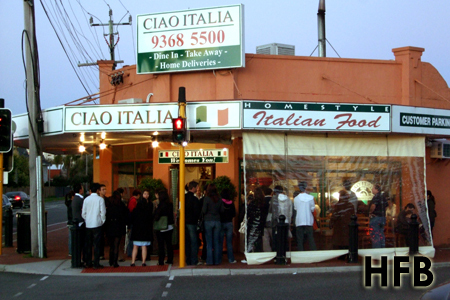 Opened in August 1999, by a (then) young Italian chef, Spartaco Rotella, Ciao Italia started out as a takeaway diner, but slowly expanded from 5 to 15 tables (55pax), holed within the small space. Hence, due to the restriction of space, they do not accept reservations! HFB was definitely overwhelmed when he entered the place. Truth to be told, this place was a riot – one would be amazed at how tight the place was, with only millimetres worth of space in between the tables. But yet it is precisely the efficient and orderly manner that the staffs carried on with their work amongst the chaos that gave this quaint little place its character! 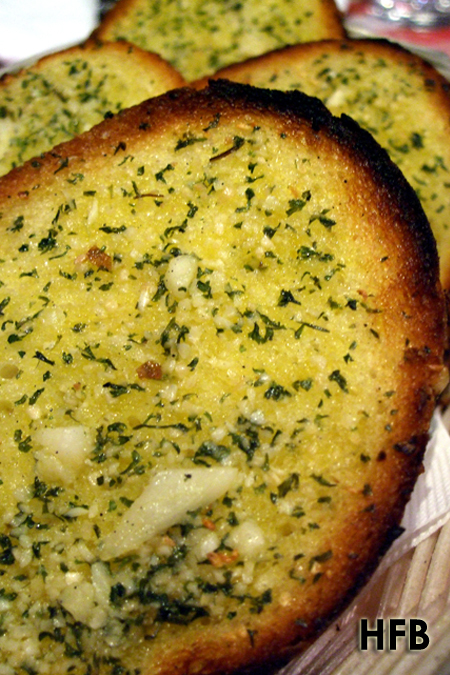 Although slightly over burnt at the side, the visibly chopped garlic and wild herbs, along with the crusty goodness of the Garlic Bread ($5.50) more than made up for it. Since we were forewarned of the serving portion, we ordered a few dishes including the Sicilian Pizza ($24.50) to share. Consisting of Mozzarella Cheese, Mild Italian Sausage, Bacon, Black Olives, Ricotta Cheese and Mushrooms on Whole Peeled Tomato Paste, the pizza was delightful, but HFB had tried better ones. Kudos to the generous toppings, he enjoyed the mozzarella cheese that seeks to balance the heaviness of the aftertaste from the sausages and the bacon. 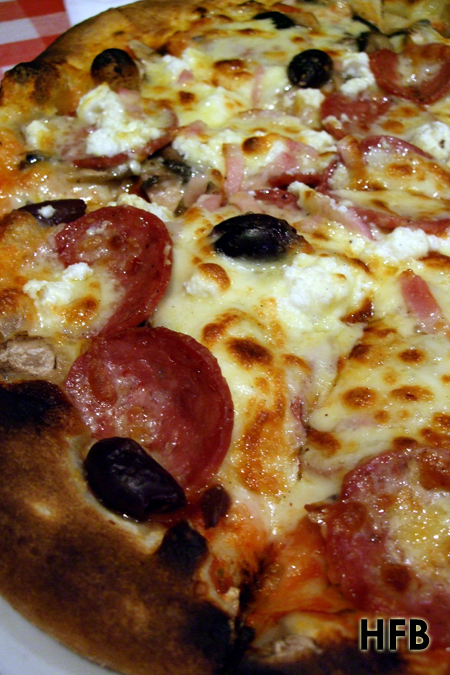 He also liked the fact that the crust was slightly thicker than the usual Italian crust we were accustomed with, which provided more bite to the pizza. 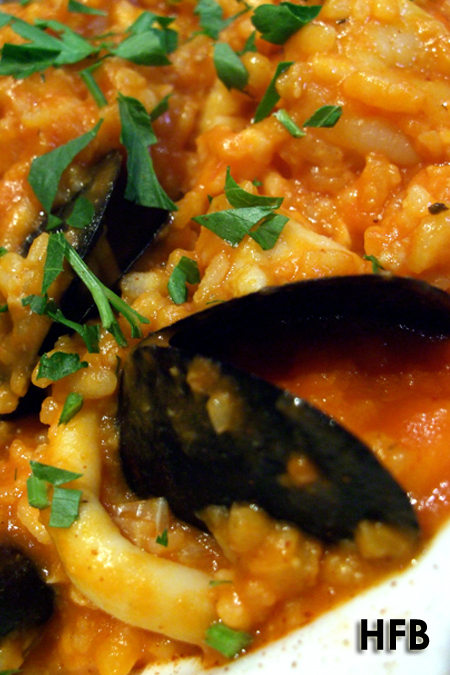 For reasons unknown, he was craving for risotto that evening and so, Risotto Marinara ($27.50) it was. 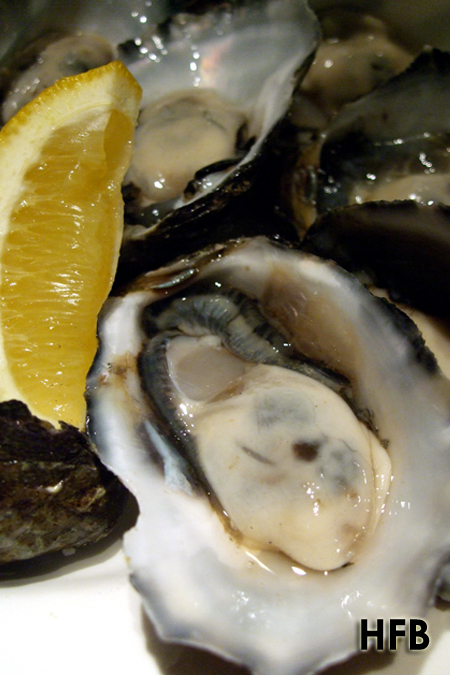 Nicely flavoured with abundance of seafood (including his beloved Black Mussels! ), HFB did thought that the rice could be done more al dente. And what’s an Italian dinner without pasta? 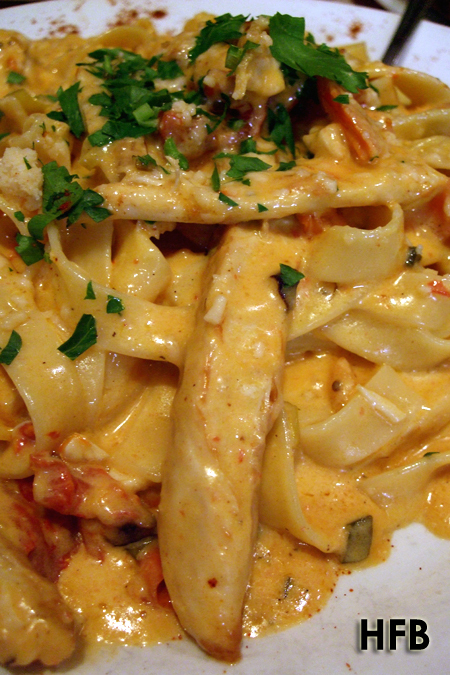 We ordered their aptly named Fettuccine Ciao Italia ($25.50), done with own combination of Marinated Tender Chicken Strips with Sundried Tomatoes and Spring Onions, served with Fresh Diced Tomatoes in a Creamy White Sauce. Generous amount of ingredients – checked, tendered chicken – checked, delightful pasta sauce – checked. If there was one thing he could picked on, it was that it was too creamy and made second helping a chore. Dessert time? 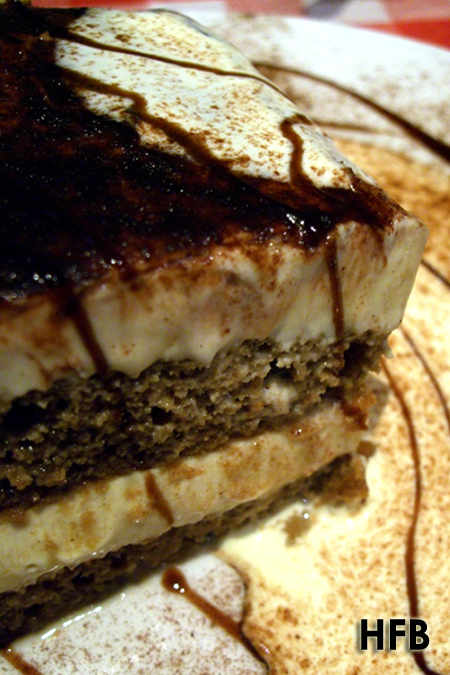 Well, we rewarded our stomachs with their renowned Tiramisu ($8.50), which were freshly made everyday with their top secret recipe coming directly from Rome. HFB loved the fact that it had thick double layers of Mascarpone Cheese. It was truly legendary! Ristorante De Parma - Falling in Love with Desserts!!! Swan Valley (and not Margaret River), just 25 minutes away from Perth City, is Western Australia’s oldest wine region. While HFB did the customary wineries and Caversham Wildlife Park tour, it was a micro-brewery that he was looking forward to. 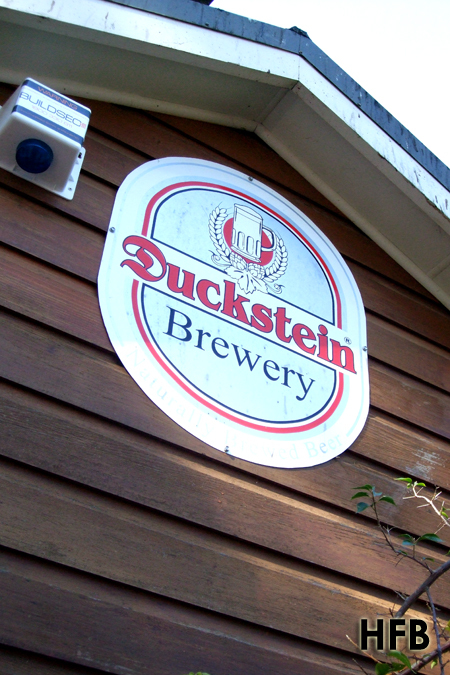 Not only does Duckstein Brewery produce premium beer where only Water, Malt and Hops are used, it continues to offer a traditional German dining experience. 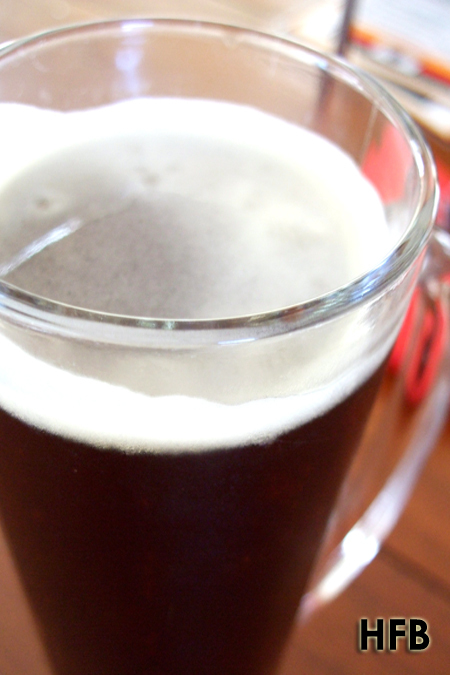 Whoever enters a drinking hole without downing a beer – HFB’s choice was their Dunkel (Dark) Beer ($7.00 for ½ pint), a typical Munich Malted beer made nutty, toast and with a hint of chocolate flavour – the brewer’s favourite. 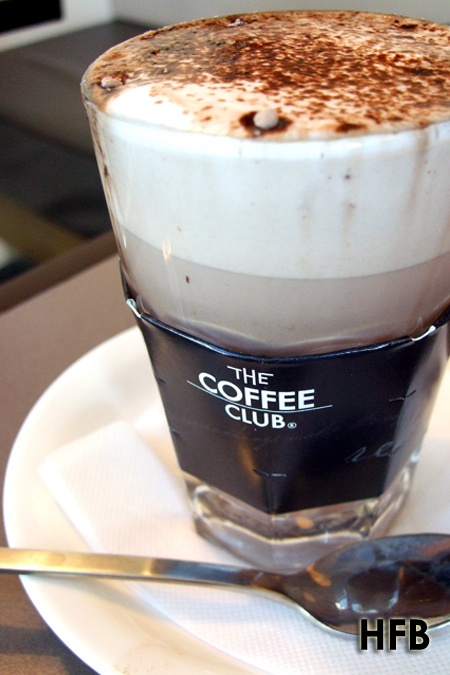 It also recently won a silver medal from the Australian International Beer Awards 2009. 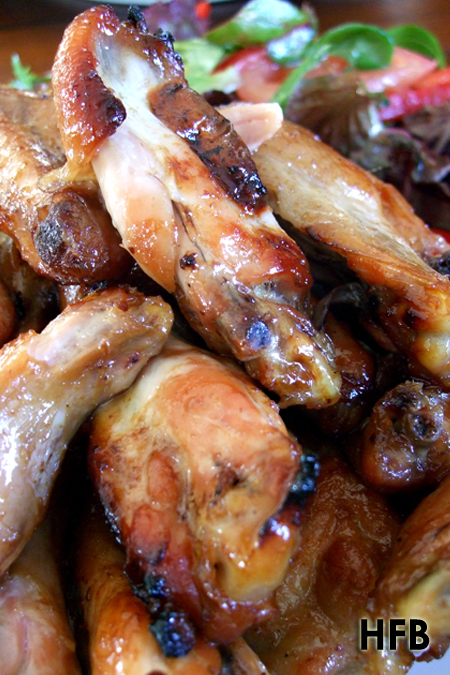 Starter shared was their, off-the-menu daily special, Grilled Chicken Wings ($17.00) marinated in Honey, Soy and Garlic served with Fresh Garden Salad. 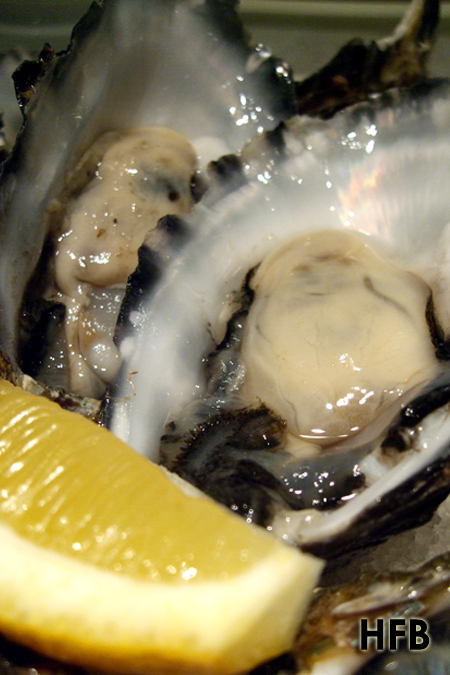 So simple sounding – yet so delicious! The wings were fully flavoured and succulent, and the serving portion was gigantic. Worth every penny of it! 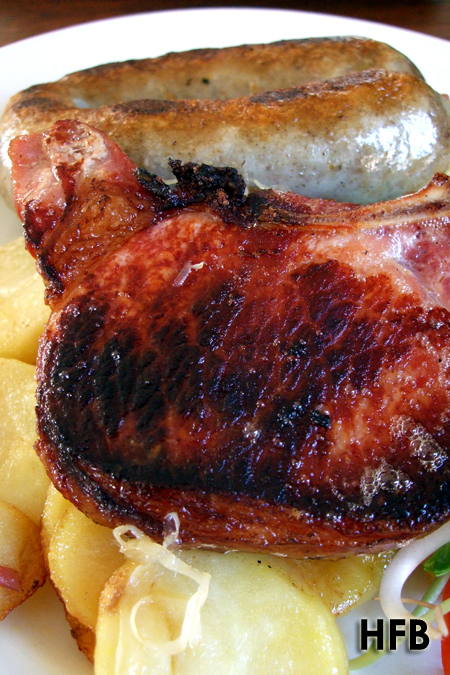 But the dish that HFB was really looking forward to was his main, the Grill Plate of Grilled Bratwurst Sausage and Kassler Smoked Pork Cutlet served with Pan-fried Potatoes and Sauerkraut ($29.50). Nicely char-grilled on the exterior, with a nice perfect smoky flavour when one chomped on it, the pork cutlet is what really makes the journey worthwhile. And may HFB add that the potatoes at the side tasted equally marvellous! They say in Australia, there are two recognisable retail stores you shouldn’t missed. Both deck in black and white - one is Myer, the other being the more premium rival, David Jones. 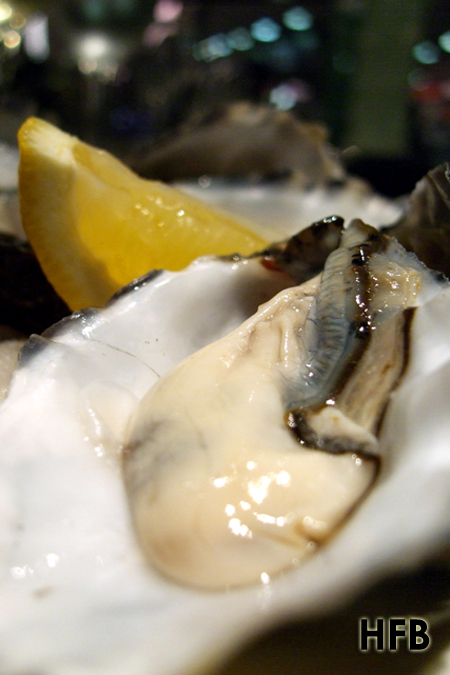 While the main activity was late-night shopping, the other side activity HFB love to indulge at David Jones is also shade in black and white (well, sometimes greyish) – that’s right OYSTERS! 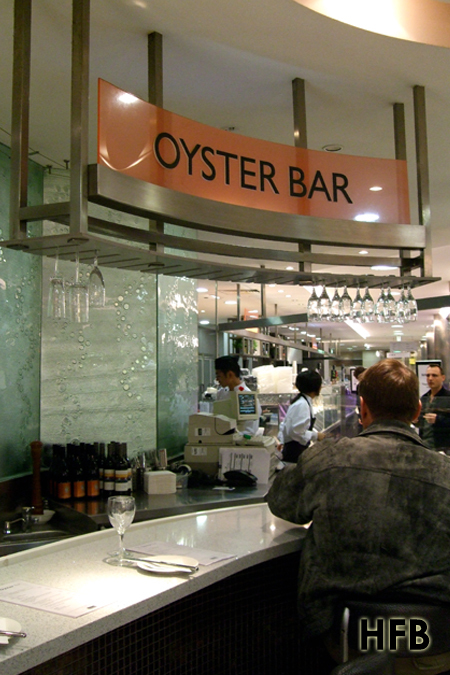 Situated at their basement, one will find the Oyster Bar nicely positioned with the rest of the food counters – a food court if one might call it. 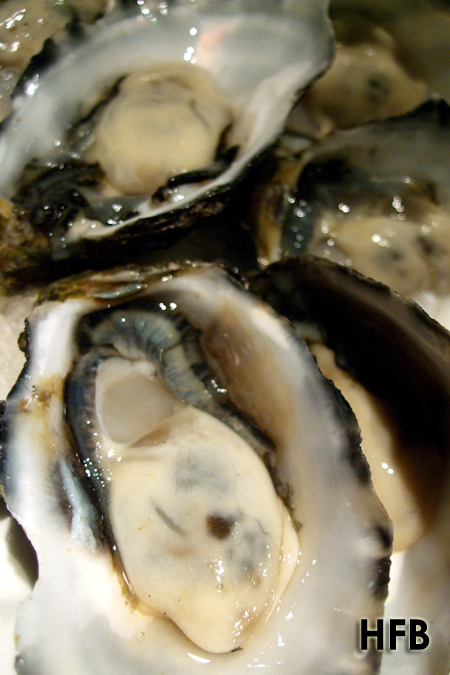 It’s probably a little more expensive than the other oyster bars (HFB’s favourite is the one at Mill Point, South Perth), but HFB loved the fact that it was tucked away from the buzzing crowd shopping away, and he could really take his time to indulge in them – more so if one did it during the non-peak hours. 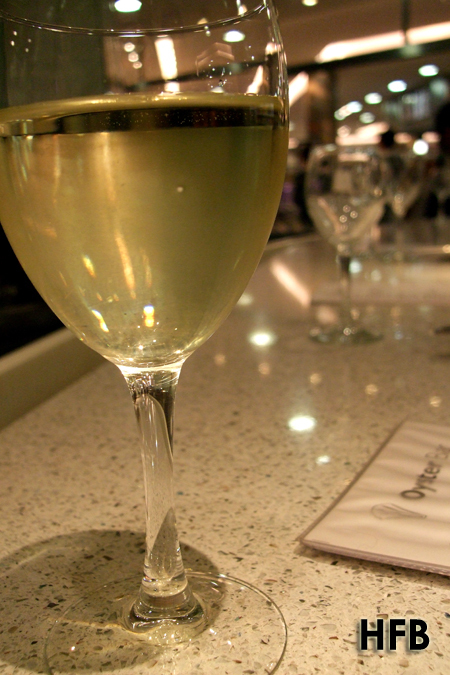 He loved to start with a white, usually from WA – this one was from Pemberton – but otherwise bubbles worked just as fine. The feasting began with a small serving of salad greens, nice gesture, but otherwise nothing breathtaking. But what took place thereafter was divine – the sacred moment that words cannot described. 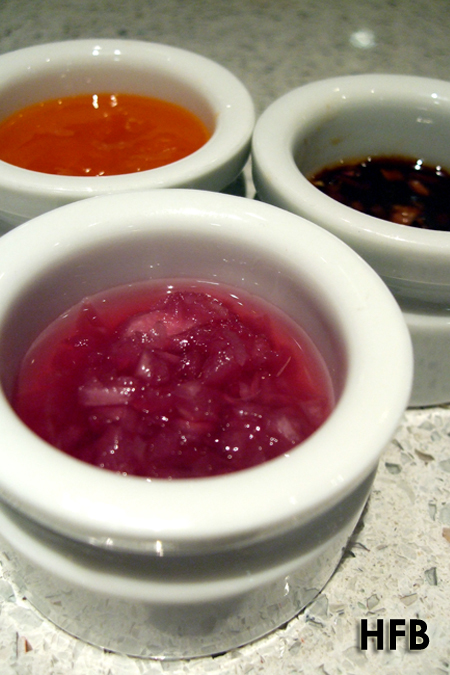 And the 3 sauces that accompanied it, Seafood Cocktail Sauce, Shallots with Red Vinaigrette, and Garlic with Soy Sauce and hint of Sesame Oil only seeks to accentuate its glory. Oops, how about another dozen more? Slurp! Ok just one last serving, promise, Slurp! Firm, meaty with a hint of creaminess, the ritual was completed. For the pagans who do not abide with this devout practice, the Chirashi Bowls served at the sushi counter next to it is, well, almost as good. What’s a Friday in Perth City without an outlet shopping trip to Harbour Town? It also helped that HFB’s accommodation was just a stone throw away. 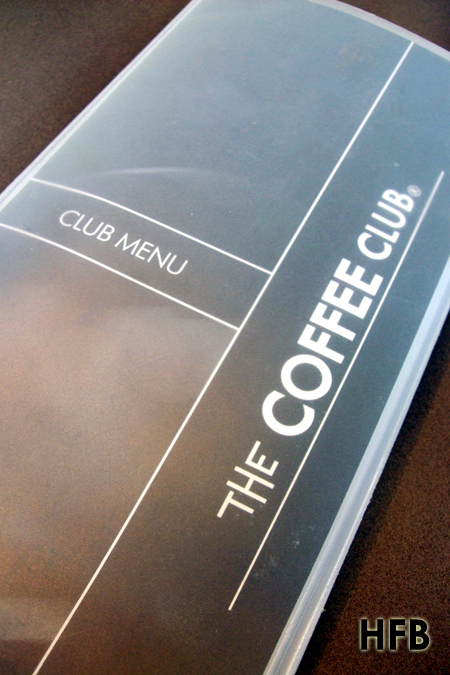 And what better way to kickstart the morning, but with a nice serving of Hot Chocolate and a plate of cholesterol-high Poached Eggs topped with Ham and Hollandaise Sauce on Toast from The Coffee Club at Harbour Town. 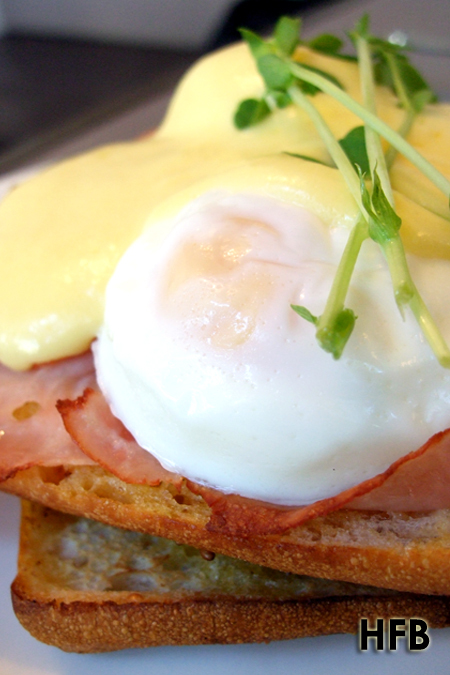 While the former was nothing to shout of (Fast Eddy’s served one of the best hot chocolate in Perth IMHO), HFB thought the hollandaise sauce for the eggs were pretty good – smooth, creamy and not over-salty. 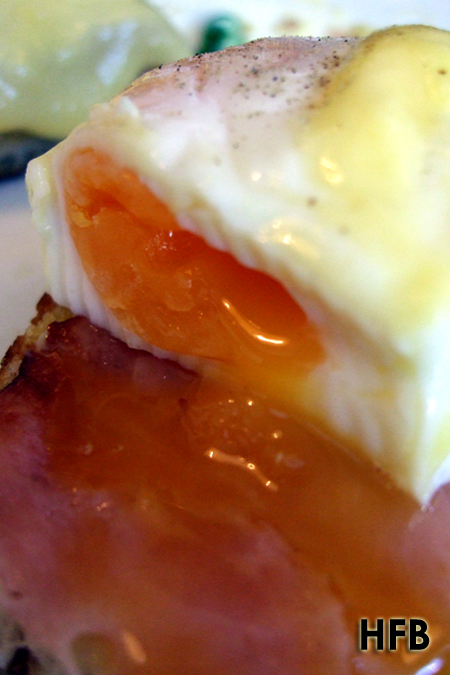 It also helped that the egg yolk was semi-runny. Next stop, Perth City for more shopping! 2009 was a year of deliberation. Indeed, there were many life decisions to be made. For all who still do not know, HFB have quit his job of almost 3 years and finally took a step of faith (well, some called it stupidity) to sign up a 15 months full time culinary course. You see, it has always been his dream to start a food establishment of his own, and he reckons it was time to work towards it. That being said, 2010 is therefore a year of putting words (and thoughts) into action, and tons of excitement awaits. And fret not, he would somehow still find time to update this beloved blog despite his new hectic schedule – just for all you faithful readers out there. Change is good... well sometimes. And hopefully, 2010 will also mean a revamp blog template for HFB. Maybe a 3 column, maybe WordPress – we shall see. But hopefully he can squeeze some time to look into it. Otherwise, any web experts out there who would like to volunteer their expertise is gladly welcome! You know how to reach me. And if you also have not been kept informed via his Twitter updates (yes, you can find it at the side bar), HFB have been travelling for the past one month around various parts of Australia including Melbourne, Sydney and Tasmania. Plus his trip to Perth earlier this year, this would mean one should also be expecting a “Taste Down Under” series on this blog coming real soon. 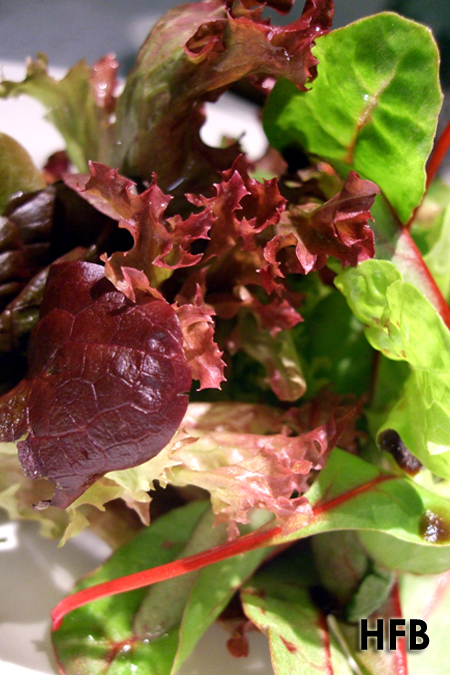 So sit tight and feast well in 2010… Bon appétit!